Fairy tales have frequently invoked disability, often using the disabled body as a motivating point for stories of change and transformation. Jay Asher and Jessica Freeburg’s graphic novel Piper explores the question of what would happen if the Pied Piper of Hamelin encountered a young woman who is Deaf and therefore couldn’t hear the allure of his magical pipe. Maggie, a young Deaf woman who has been ostracised by her village, becomes a foil for the Pied Piper, a person who has a strength that counters that of the Pied Piper. She has the ability to resist control because of being Deaf. Maggie became Deaf when children put her in a barrel when she was a child and throughout her life she experienced ostracism and violence from the rest of her community. When the Piper arrives in her town, the first thing he notices is the prevalence of violence and oppression in the community and the power that those in positions of authority or wealth exert over the rest of the community. He notices that the town has a rat infestation, which is has the ability to counter with his ability to summon rats with his pipe, but he also reads the imbalance of power in the town and wants vengeance for those who are attacked by the community. His own father died as a result of violence from a community that ostracized him and this has left the Piper aware of the violence that ostracism can visit on those who don’t conform. Asher and Freeburg give us a modified version of the tale, giving further context to why the Piper eventually lures all of the children away from the village beyond the fact that the town doesn’t pay him for removing all of the rats. The tale evokes disability again when the kidnapping of the village’s children is discovered after a disabled child is unable to keep up with the rest of the children and therefore escapes the Piper’s abduction, therefore situating this tale as one that uses disability and Deafness as symbolic media within the context of the tale, associating bodily difference as a way to demonstrate the town of Hamelin’s abuse toward disempowered groups. This is also a fairy tale within a fairy tale since Maggie creates stories about those who have been violent toward her. She shifts the narratives that are imposed on her and remakes herself into a position of power by retelling her experiences as fairy tales. Ultimately, she shifts the tale of the Piper of Hamelin, her own tale, in order to modify it, remaking the story into the one that is familiar from legend and obscuring the reality of the tale. 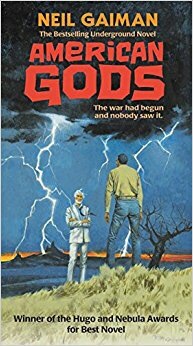 A review of Neil Gaiman’s American Gods (William Morrow premium printing, 2016). Neil Gaiman’s American Gods begins with a quote by folklorist Richard Dorson exploring ideas of immigration and the tales that people bring with them when they migrate. Dorson states “one question that has always intrigued me is what happens to demonic beings when immigrants move from their homelands”, and Gaiman answers this inquiry in the form of a story, the perfect response to a question of how stories change as people migrate. This sense of migratory folklore suffuses the book, and Gaiman’s writing is as much a philosophical dissertation on the nature of storytelling as it is a fictional story about a human encounter with the gods. Gaiman explores the idea that America is a space where gods are swallowed up, forgotten as they are digested in a capitalist rush toward the newest, best thing. In order to emphasize this rapid change of gods, Gaiman introduces new modern gods born of capitalism, a god of Media, Dot Com Start Up gods, and gods of commerce. Gaiman focuses his tale primarily on gods and the myths that surround them, but brings in elements of folklore as disperate as conspiracy theories, tales of aliens, urban legends, vyrkolas, fairies, and even the lies people tell to make themselves seem more interesting. These all meld and blend together through the power of Story, something that is invested with belief, disbelief, and fascination all at once. Gaiman even explores the myth of nations, the communities formed through a loose shared belief that a group of people deserve to occupy a certain geography and the stories and institutions they create to belong there. This myth seems to hold the most sway for Gaiman since his gods seem to be bound by national boundaries and other versions of those gods exist in different nations. Gaiman’s text delves problematically into areas influenced by colonial rhetoric as he explores different migrations to this ‘new world’, and although he does acknowledge that indigenous beings have a presence on the landscape, he frequently puts these beings into the categories of defeated old spirits and suggests that they don’t occupy the same standing as gods. Gaiman identifies indigenous spirits with the landscape rather than with the people, and the Buffalo spirit that visits his protagonist, Shadow, tells him, for example, that it is a creature of geography rather than a god. This problematically continues images of aboriginal people associated with the land and portrayed as fading in waves of colonialism. Gaiman structures his text around waves of immigration, portraying American as a land of immigrants rather than an invaded land that has original occupants that still remain on it, though oppressed. Indeed, the character Wednesday (who is a god) suggests “Nobody’s American. Not originally” erasing the aboriginal inhabitation on the American landscape and their claims of original occupancy. Gaiman explores the myth of progress and how this has made Americans forgetful, particularly as they rewrite their own history and forge their nation out of the history they want to believe occurred. He reminds readers that we are in a constant process of creating new stories that we tell ourselves in order to understand our place in the world, continually revising our folklore to make it relevant to us, or abandoning it in favour of new tales. Yet American Gods is suffused with magic. Every page reads like an invocation to ancient and new gods that haunt the shadowy places of our imagination, reminding us that we need stories to survive… and that our stories need us to survive. He reminds us of the magic of metaphor, the way that metaphors are creative acts that give birth to new gods of the imagination, new ideas seeking a form. His gods are physical manifestations of ideas, embodied stories, or, as the character Jesus suggests in the story, that gods are memes. He asks us “Have you thought about what it means to be a god? IT means you give up your mortal existence to become a meme: something that lives forever in people’s minds, like the tune of a nursery rhyme. It means that everyone gets to recreate you in their own minds. You barely have your own identity any more. Instead you’re a thousand aspects of what people need you to be. And everyone wants something different from you. Nothing is fixed, nothing is stable.” For Gaiman’s Jesus character, being a god is being a fluid creation of the human imagination. Gaiman puts a huge burden on storytellers, the burden of creating new gods, of building new myths for us to live by and understand ourselves through. Gaiman’s America is a place where ideas are constantly clashing and reforming, a place where ideas from multiple people melt together and pour themselves into the moulds that are needed at the time only to be reforged again. When we first founded TTW, I knew I wanted to interview and feature the work of Erin Kathleen Bahl, a digital humanities scholar with an interest in folklore. Her interdisciplinary scholarship is often, at its core, about how we tell stories through text, images, objects, memory, and more. Her beautiful webcomic “Citrus and Canaries: The Witch’s Orchard Charm,” which she created for TTW, can be viewed here. Through The Twisted Woods: Tell us a little about yourself! What kind of work do you do? Erin Kathleen Bahl: I am a PhD candidate working at the intersections of digital media, composition, and folklore. I’m especially interested in varying forms of visual narrative; my creative work most definitely informs and is informed by my scholarly work in return. I’ve worked with collaborators on projects involving magical girl anime, 3D motion capture of classical Indian dance, and digital remixes of traditional fairy tales such as “The Singing, Springing Lark” and “The Bremen Town Musicians.” Ultimately, I’m interested in acts of creative making across a range of media environments, and in creating knowledge and telling stories with digital technologies. TTW: How did you become interested in traditional narratives? And how did you become interested in digital media? Erin Kathleen Bahl: I was extremely fortunate that my small-town middle/high school offered a storytelling category on our speech and debate team. I competed as a storyteller for six years; the repertoire included a range of traditional stories such as folk tales, fairy tales, and wonder tales from around the world. It was incredible to me how one person could create an entire world for their audience with just their face, voice, and body, and I loved to see how each storyteller brought new life to the tale based on their unique style and individual interpretation. My interests in digital media were sparked via Wagnerian opera. I worked on Siegfried for several months as a dramaturgy intern at the Hannover State Opera House and was entranced by Wagner’s theories of Gesamtkunstwerk, or “total artwork” that incorporates multiple media and sensory channels. Digital media became a route for me to explore multimedia possibilities as an individual composer, without the resources afforded by a full opera house. TTW: What are your thoughts on mixing folk and fairy tales and digital media? What inspires you to pursue this kind of work? Erin Kathleen Bahl: I’m most definitely inspired by the creative community around fairy tales that I’ve encountered both in person and online. There are so many individuals doing beautiful, intriguing, exquisitely crafted fairy tale-related work in a range of contexts, from poetry to jewelry to fashion to music and more! My creative making happens to be primarily digital, and I hope to contribute in my own way alongside others’ inspiring, magical work. TTW: Is it different to work in that kind of media with such old materials as your start? Why do it? Does it lend itself better to presenting the unheard stories somehow? Erin Kathleen Bahl: I don’t necessarily see a sharp break between “new” media and “old” story materials—in fifty years or so (or five, even!) the tools I’m working with now may very well be considered ancient! I still feel so new to digital composing in many ways that it’s very comforting to work with familiar stories as a starting point. Working with a fairy tale gives me an underlying structure to rely on in generating ideas, from which I can then feel free to experiment with images, text, and panel structure. I hope to be one of many contemporary voices in dialogue with a vibrant tradition of creative storytelling, in which familiar narratives move across the media forms available in a given time and place. TTW: Do you feel that oral storytelling and digital media are connected? How? Erin Kathleen Bahl: In some ways, yes! Both are tools that can be used to create one instance of variation on a traditional source tale. Both deliberately use multiple mediating channels to design an audience’s experience of a story; an oral storyteller might make use of voice, face, and gesture, for example, while a digital media composer might choose to include visual, textual, audio, or video elements. With multiple mediating channels, too, come multiple potential channels of access, which is especially important in working so that audience members of varying abilities have equally rich access to the narrative experience. TTW: Do you have any thoughts about how digital media can make traditional narratives and fairy tales more accessible? Erin Kathleen Bahl: I mentioned access for differing abilities briefly above; I also think digital technologies can make traditional narratives more accessible through increased ease of transmission and distribution. Stories from around the world, from multiple traditions and cultures, can be read and shared much more easily today than a century ago. With the online groups I’m part of, additionally, I can see how other individuals may have interpreted and responded to a story differently based on their own unique perspectives and experiences. I come to understand and appreciate more fully the complex layers at the hearts of familiar tales when I have the chance to look at them through other peoples’ eyes. TTW: What is your favorite fairy tale? TTW: What inspired you to create the piece you made for TTW? Erin Kathleen Bahl: I tend to be inspired by a single image that captures my attention, and that I want to explore in more detail. In the case of this comic, what grabbed me first was the idea of the witch in an orchard full of canaries (i.e., what if the canaries emerging from the stolen oranges in the source tale were not exceptions, but part of a larger flock?) I knew I wanted to build up to that moment, and as I worked the piece slowly picked up more sinister undertones—by the end, the explosion of canaries was no longer a moment of delirious joy, but a fleeting, fragile moment of sunshine in a cold world. I’d like for my work to be rich in suggestion and short on explanation, though, so I’m curious to hear how others respond to and interpret the piece! TTW: Where would you like to see digital art inspired by folklore go next? Are there any projects you’d like to do or that you’d like to see happen? Erin Kathleen Bahl: I’d love to see it go everywhere! I’m currently working with Brittany Warman on a creative web-piece called “Facets”—we combine poetry, illustrations, and web design in varying arrangements to present a critical/creative reading of “The Singing, Springing Lark.” I’m also working with Margaret Price on a creative digital scholarly project that uses “The Bremen Town Musicians” to explore audio description of visual narrative as an integral part of a more broadly accessible storytelling experience. In general, I’d love to see more collaborative online spaces like Through the Twisted Woods that fuse scholarship and art, and that are committed to foregrounding marginalized voices in fairy tale and folk narratives. I also hope to see (and help create!) more short-form comics, print or digital, that engage traditional narratives as source material or stylistic inspiration—there’s a lot of great work out there, but there’s always more to explore! Erin Kathleen Bahl is a doctoral candidate in the English department at the Ohio State University studying digital media, composition, and folklore. Her research investigates the possibilities that new media and digital technologies offer for creating knowledge and telling stories. She is currently working on a dissertation exploring processes of invention and design in composing new media scholarship. Her work has been published in The Nashville Review, Composition Studies, Humanities Journal, Harlot of the Arts, Signs and Media, Showcasing the Best of CIWIC/DMAC, and Computers and Composition (print and online). Through the Twisted Woods interviews author, storyteller, and performance artist Marie Bilodeau about French Canadian Fairy Tales, minority languages and cultural preservation, the endurance of Fairy Tales, cultural appropriation versus translation, Celtic Fairy Tales, rewriting Fairy Tales onto modernity, the Fairy Apocalypse (or Fairypocalypse), mapping fairy stories onto new geographies, performance and storytelling of fairy tales, considering the audience for fairy tales, and magical objects in fairy tales.